NOTICE: Some of countries' customhouse need to impose import duties, please be informed that! Import duties should be paid by the buyer! If you don't clear whether your country impose the import duties, please inquiry your country customhouse before you buy the items. Thanks! All customized costumes making time are 4-50 days. By China Post Air Mail shipping(Default shipping ) , normally needs about 15-40 days to arrive after shipping,sometimes will be longer by the reasons like: bad weather, airline delay, custom checking speed, holidays..etc..
By EMS/DHL express shipping, normally needs about 3-8 working days, sometimes will be longer by the reasons like: bad weather, airline delay, custom checking speed, holidays..etc. 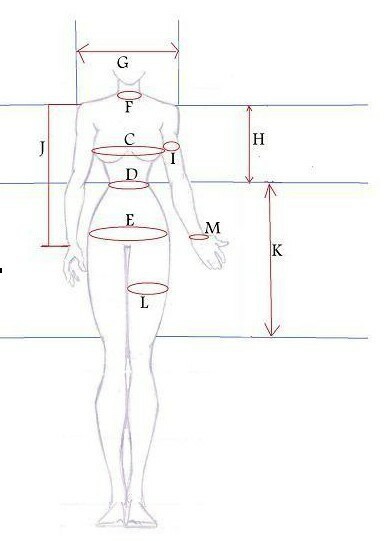 For all Custom-Made items, we need close-fitting measurements(in cm/inch, weight in kg/pounds), this can help us to make.